We made a bad move many years ago. We largely rejected the idea of Calling. It sounded too Baptist. It sounded to denominational. It sounded to Calvinist. It was, like some other things in our theology, the product of reactionary doctrine rather than solid interpretation. It isn’t that I agree with Calvinism but we can embrace words in their fullest biblical sense. Our theology should never be a game of compare and contrast to determine what is true. The problem was, not everything the Baptists, denominations, and Calvinists have in common are wrong (as some in our fellowship had presumed). They all believe Jesus is the Son of God. Do we reject that notion? They also all believe in calling. We should too. If you don’t believe in calling, I hope this post changes your mind. Our rejection of calling has left us with a spiritual Dissociative Identity Disorder (formerly known as Multiple Personality Disorder). We are hyper-confident, hyper-certain, and hyper-unsure and hyper-uncertain all at the same time. It is crazy confusing. We have been the only ones who have it right AND the ones who really don’t know if we are saved. How confusing is that? We have made salvation an issue of getting so many things right that it makes one wonder if one can ever be saved in the first place – what if we are wrong on something. Salvation was never meant to be a matter of getting it all right. Salvation never rested on our shoulders. It rested on Christ’s shoulders. We didn’t know we were elect and we certainly didn’t believe we were called much less that we were sure about any of it? You know who we thought were called? The first disciples. Jesus never called us, the theory goes. Jesus called them. But that conclusion many of us reached doesn’t hold water. It doesn’t hold water because the New Testament itself constantly refers to Christians who never met Jesus in their lifetime as “called.” That means we can be called as well – not just “can be called” – we are called! If you are a Christian you have been called. What does this have to do with discipleship? Recognizing calling is the first step to recognizing that we are disciples, followers, apprentices. Jesus didn’t just call them. He called us too. We have responded. That makes us disciples because the called very specific. It was to come and follow him. No more nominal Christianity. No more sitting the fence. 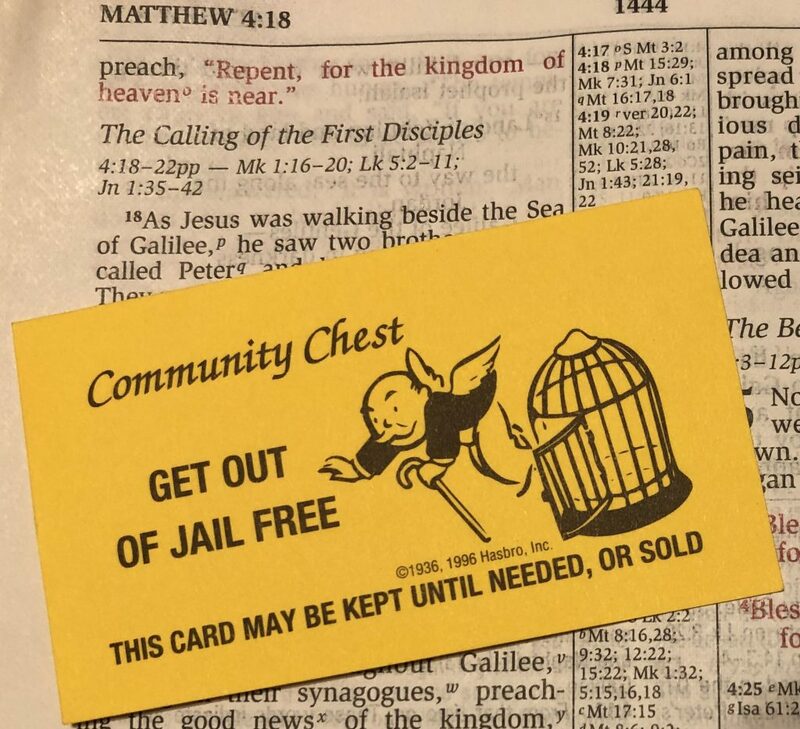 No more Christianity as a get out of jail free for hell card. No. It is time to recognize ourselves as the called and take our place as disciples/followers. It is time to be sure of your salvation. It is time to hear the call and follow Jesus. This is what makes our lives meaningful. Don’t walk away. Don’t reject this. Let’s do this…together. What has your relationship with the word calling or called been in church? Do these thoughts bring you any clarity or questions? I was raised as a Southern Baptist. I left the church in the early 80’s, told myself it was because of the in fighting going on at the time. To be honest, it was really the fact I was 18 and no longer had to answer to my parents. That being said, it was a very Godly COC family and congregation that drew me back to God at a low point in my life. It took me many years, to become adjusted to the COC manner of conducting “church”. I still have issues from time to time. I would talk about a calling and always got blank looks from members. It had me confused and still has me confused. I grew up being taught and still believe that God calls people to do particular tasks or things. Not everyone one is called to preach, teach, or lead singing. We are all called to serve God and others. We are all called to share his love. But each of us are called in different ways to use our talents to glorify him. Why is this such a difficult concept? Is it just a manner of semantics? It is bizarre indeed that we can make such a big deal out of following scriptures while rejecting things that are clearly in the scriptures. I believe the reason was we didn’t want to “sound denominational.” Pure and simple. What a shame. Usually when I hear the term calling I hear it in relation to “preachers /teachers” having been called into that profession, but as noted here all saints are called and have responded in the call. It isn’t about being called to do something, but rather being called to be something. Once we are something, we can do anything through Christ. Very well said Dwight. To be a Christian is to be someone who has responded to the call. I am afraid much of our thinking is too nominal. It is about beliefs we embrace that aren’t tied to action. You believe this and I believe that – this makes you a Hindu or Muslim, etc and me a Christian. To be a Christian is to have been called to follow Jesus and have responded = disciple. And after that, not another mention of “disciples…” Saints? Yes. brethren? Yes. Stones? Yes. Priests? Yest. workers? Yes. But “disciples” is not used anywhere after Acts 21. I think the terms like “Saint” etc. make more sense to be used. It shows the same qualities as you have mentioned for “disciple,” including the failings (Compare 1 Corinthians 1:1-3 with 3:1-3). Words like “Saints” and “Child of God” has a much deeper meaning. An exhortation to be “imitators of God” gives a much greater responsibility. I like where you are going with this. Saints has more umph than “Christian for sure. I would say that a disciple is a bit more than a student. It is a student who desires to be a practitioner of what the teacher is teaching. In today’s world not all students aspire to do that. Blessings.